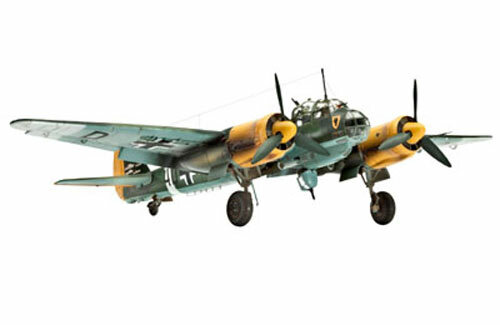 All Products > "04672 Revell 1/72 Ju-88"
The Ju 88 was the most universal German aircraft of the Second World War. It served as a Dive-Bomber, a Night-Fighter, a Torpedo Bomber as well as a Mine-layer and Reconnaissance Aircraft. Production commenced with the Ju 88A-1 in September 1939. The Ju 88 saw its first action during the occupation of Norway followed in August by an increase in attacks on the British mainland. Structural improvements to the A-1 led to an improved defensive armament and changes in thewing design. 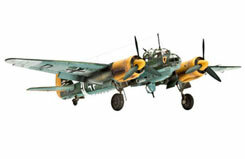 The subsequent version was designated A-4 and became the Luftwaffe's standard bomber. It entered mass production and became the basis forall further development of the Ju 88 as a bomber, ground attack and reconnaissance aircraft. 3094 aircraft were built in 1942 alone.